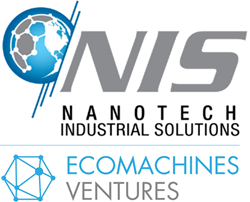 Nanotech Industrial Solutions, Inc (NIS) has completed a $12m growth capital round to accelerate sales and continue developing new applications of its path-breaking nano-additives technology. The round was led and syndicated by EcoMachines Ventures, a long-term investor in NIS. NIS has raised $12m in venture capital investment, from existing and new investors, providing growth capital to help the company scale sales and develop new market applications with their proven nano-particle technology. NIS is the only manufacturer of nano-sized particles of Inorganic Fullerene-like Tungsten Disulfide, producing high performance additives for greases, industrial lubricants (including gear oils, transmission oils, chain oils etc. ), metal working fluids and other lubricating fluids. The company’s unique, patented particle technology reduces friction and wear whilst increasing the extreme pressure capacity of lubricants. This leads to significantly reduced downtimes and cost of ownership whilst increasing resource efficiency in the automotive industry (engine and gear oils) and industrial applications (engine oils, chain oils, gear oils, greases, etc). NIS produces high performance additives for greases, industrial lubricants (including gear oils, transmission oils, chain oils etc. ), metal working fluids (water based and emulsions) and other lubricating fluids including drilling. NIS’ patented technology releases nano-structured materials under certain physical conditions. The unique morphology significantly improves friction and wear properties, resulting in a substantial contribution of the technology to resource efficiency of cars, power plants and industrial plants. According to a Markets & Markets report, the lubricants additives market alone is expected to reach $16.2bn by 2019, while according to Grand View Research the metal working fluids market reached $9.6bn in 2016. Growth drivers in these markets include tightening environmental regulations, and greater expectations for resource efficiency by operators. Dr. Ilian Iliev, Managing Director, EcoMachines Ventures, tel. +44 (0)203 761 6138, email: info(at)ecomachinesventures.com. Nanotech Industrial Solutions is the manufacturer of an innovative line of nano-lubricants, additives, metal working fluids greases and coatings based on inorganic particles of fullerene-like tungsten disulfide. This revolutionary invention was first developed in 1992 by Prof. Reshef Tenne who was nominated for a Nobel Prize. This invention is exclusively licensed to Nanotech Industrial Solutions for manufacturing and commercialization worldwide. NIS has attracted the best minds in the fields of nanotechnology, chemistry, and various targeted industry applications like lubricating oils, greases, coatings, metal working fluids, polymers and composites. NIS's global corporate office, commercialization R&D lab, manufacturing, blending and packaging facilities are located in Avenel, NJ. EcoMachines Ventures (EMV) is a London-based investor focused on B2B companies in the industrial high-tech, energy, resource efficiency/circular economy, smart cities and transportation sectors. EMV invests in, and provides advisory services related to, investments that involve a range of technologies including robotics and AI, materials science, IoT, advanced engineering and power electronics. EMV has invested alongside some of the world’s leading corporations, including ABB, Philips Lighting, Evonik Industries and Flex. Founded by Dr. Ilian Iliev in 2013, EMV has a unique multidisciplinary team with expertise in investment, deep industry, corporate finance and M&A. EcoMachines Ventures Limited is an appointed representative of Capital Deposit Limited, which is authorised and regulated by the Financial Conduct Authority.